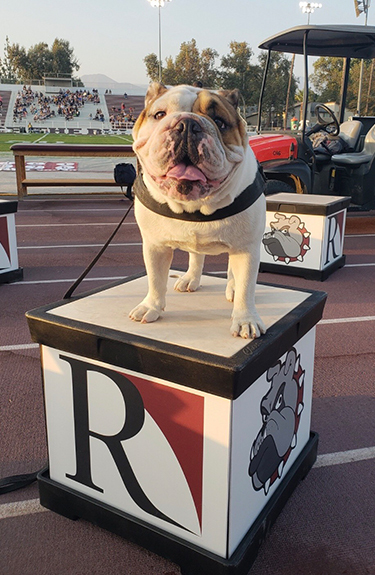 Last week was the best week ever: the new University of Redlands students moved in, and I finally got to return to my mascot duties! 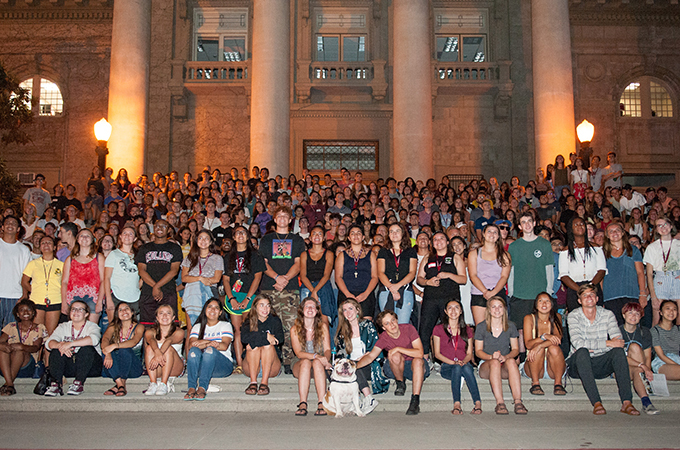 New Student Orientation Week kicked off on Wednesday when the new students arrived. 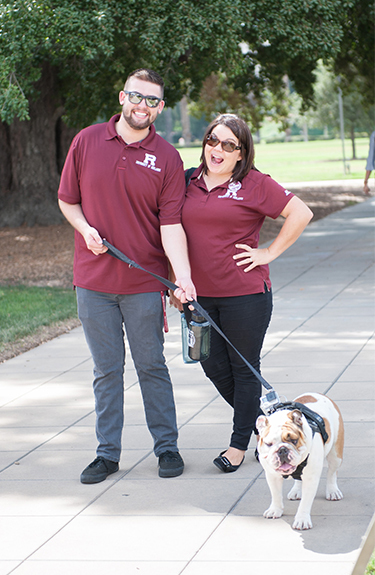 I suited up with a GoPro action camera and trotted over to Hunsaker Plaza to meet everyone. I got so many pats on the head, I was worried I might end up with a concussion, but it was worth it to see all the students’ and parents’ smiles. The weather was in our favor on that day; I’m not too good at math, but I’m 105 percent sure it was the coolest move-in day ever. I couldn’t really help the new students decorate their rooms since I don’t have thumbs, but I was there for moral support—and to look pretty, of course. 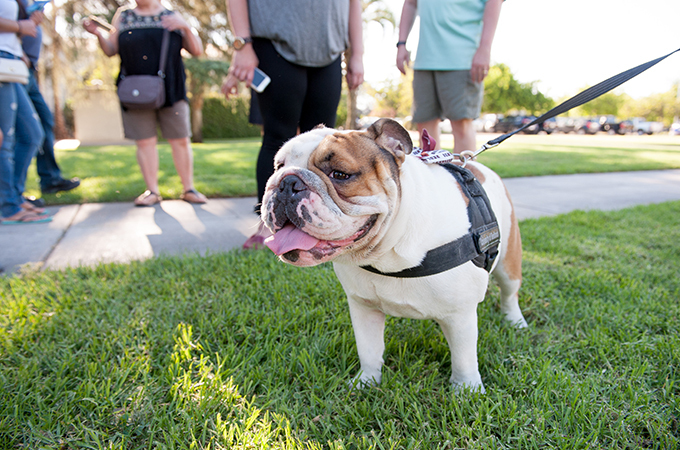 When I got hungry, I headed to the Quad for a free lunch—being a mascot has its perks! I relaxed in the shade, and my mom (Mary Littlejohn) snuck me some watermelon. Later on, I mingled with some of the University’s head honchos at the President’s Welcome Reception. I forgot my bow and cape at home, but, luckily, the event wasn’t formal. 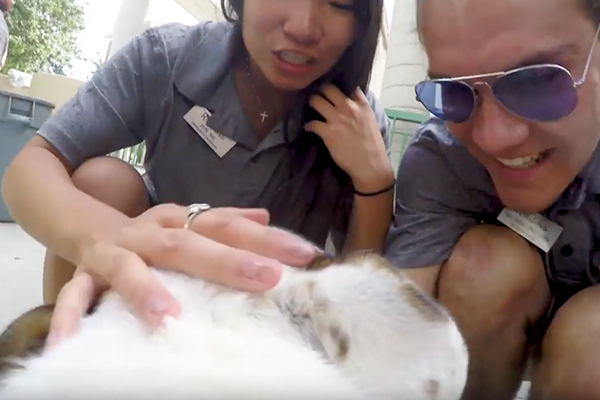 I wanted to make friends with a service dog at the reception, but I knew I couldn’t distract him from his job—honestly, it’s more important than my job! I would’ve gone to Convocation, but didn’t want to steal the spotlight. More importantly, I really needed to take a nap. It was such a long day, and it wasn’t even over yet! After the sun went down, I followed all the new students to the Administration Building so we could get our class picture taken. I was front and center! What can I say? The camera loves me. After getting a good night’s sleep, I made my acting debut in Och Tamale LIVE. I made an appearance in not one, not two, but three shows in Glenn Wallichs Theatre! I was a little nervous, and I’m really glad I didn’t have any lines—I probably would’ve forgotten them! I mainly just had to stand there and look pretty, and everyone knows I’m great at that. I wanted to go to the Glow Wild party later that night after the new students finished learning about all the academic programs on campus, but my mom said I couldn’t stay out that late. If I could put an eye-roll emoji here, I totally would. On Friday morning, I went to the Academic Fair, where students had the opportunity to talk with faculty and current students to get more in-depth information about majors, minors, and everything in between. The students lined up to take photos with me, and I’m pretty sure we broke a world record for the number of selfies we took together. I can say with the utmost confidence that New Student Orientation Week was a success, and I hope all the new students had as much fun as I did! I’m so glad to be back at work, bringing smiles to everyone’s faces every single day. I can’t wait to see what the rest of the school year brings. Don’t forget to check out my awesome GoPro footage below! Just add videographer to my résumé.